If you’ve been around a while, you know two things about me: 1. I love free reading in class and 2. I love playing games in class. (In fact, I’m teaching an entire session about input games at Comprehensible Online ) And now my two loves have merged and I’m happier than a little birdie with a french fry! 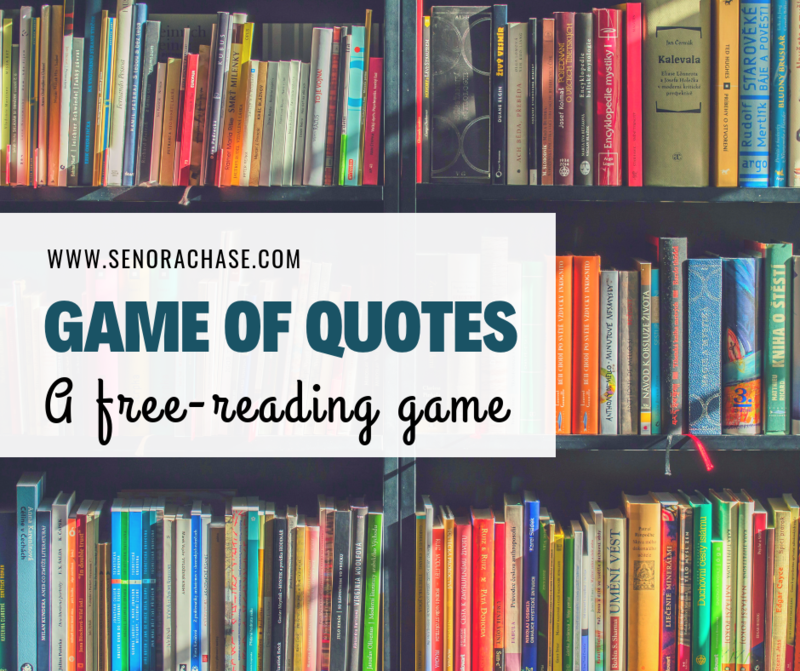 Let me present to you the funniest, most input rich reading game in the universe: The Game of Quotes. I really wish this was my idea…but nope! It’s actually a real game called Bring Your Own Book designed for book clubs. Then a brilliant teacher, Heather Marshall adapted the game to use in her English classes. Then, my colleague Amy, who is awesome enough to teach English AND Spanish, introduced our department to this game…. and the rest is history! None! My favorite type of game! Just have your little darlings do their free-reading thing and then put them in groups of 4. Everyone needs a mini whiteboard, marker, eraser and their book. Or this one for the French Version– Merci to Sophie Hade! Or this Latin Version-Gratias tibi to Ron Starling! If anyone out there up for translating it into another language, share it with me! Project a prompt from the slideshow, make sure everyone understands it, then give your students 2 (ish!) minutes to skim their book and find a good phrase, word or sentence that goes with the prompt. They should copy it onto their whiteboard. Then teacher instructs students to share their phrase/word/sentence with their group and decide which one is the funniest (or goes best with the prompt). They raise the winning whiteboard and the teacher collects the best one from each group. The teacher mixes up the boards (so no one knows which group wrote which one) and then sets the scene, of course in slow, comprehensible language. Imagine you run into class 20 minutes late. You’re panicked and you have to explain to Mr. So and So why you´re late. You know he’s going to be mad. He hates it when students arrive late! You need a really good excuse… You might tell him (Hold up 1 whiteboard and read aloud, with the proper intonation and emotion to make it as funny as you can) or another possibility is (hold up another board and read it) or perhaps you might tell him (hold up the 3rd whiteboard) You get the idea…after I read each group’s contribution, I display them on my marker ledge under the big whiteboard. Then, the class votes. Again the teacher facilitates this in slow, comprehensible language: Who thinks that X (pointing to the first mini whiteboard and reading it again) is the best excuse for arriving late to class? Who likes Y (pointing and reading again) best? Who would say Z (again, pointing and rereading). Pick the winner (if there are 2 popular ones, eliminate the others and vote again…or the teacher can pick the best!) Ask the class Who write X (read board again! See all the great repetitions here?!) and award a poker chip to the winning team. Then return the whiteboards, project a new prompt and play again. We played only 4 rounds and when we stopped, they begged for more! I promised we’d play again soon. IT IS SO MUCH FUN!! We were laughing so hard! And I’ve never seen my kiddos so focused on their books, looking for the perfect quote! Wanna watch? Disclaimer: This is my Spanish 4 class…so they understand a LOT. And I’m talking pretty fast! BUT DON’T WORRY! I’m watching their eyes…I am gauging what they are understanding. I would absolutely SLOW THE HECK DOWN for my level 1s and 2s!! And as I watch this, I think… maybe I was talking a bit too fast… I have a tendency to speed up when I get excited 🙂 Slow down, SpeedRacer!! Try it! Play it next week! I’m 98% sure this will be your (and your students’) favorite new game! First of all, thank you SO much for providing this! I tried it today in class and it was a big hit. One note though…. In the last few minutes of class, the Spanish presentation turned French.. and now I can’t seem to access the Spanish one at all! Both links provided above go to a French version of the quote game. Not sure if someone edited it? The one that had been Spanish just a few minutes ago is titled as “Game of quotes for after free reading Español” but when you look at the actual slides the text is now in French. Hopefully I can get the Spanish version because I am sure students will want to play again! Oh no!! I don’t know what happened… as soon as I get home I’ll link the Spanish version again! Thank you for letting me know!! That was a close one…not sure what happened, but you’re right, the Spanish one turned into French! It’s all fixed now!